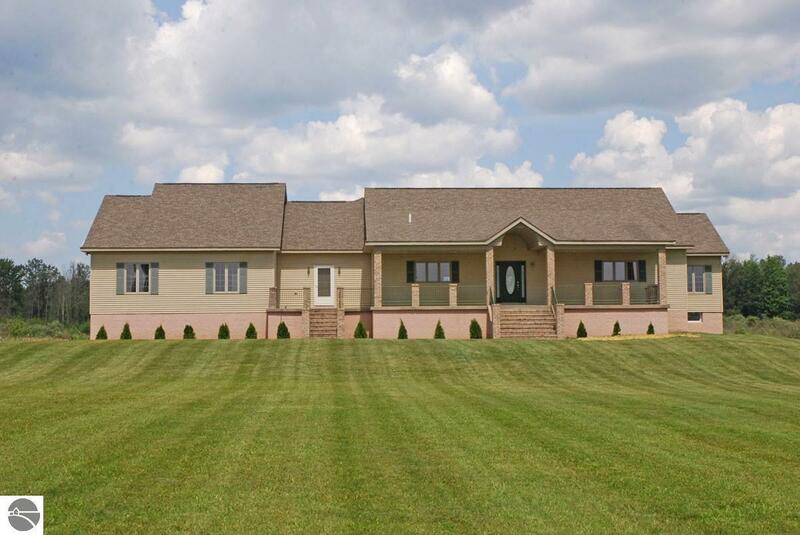 Large country estate situated on 20 acres just minutes from Tawas and Tawas Bay. This sprawling four bedroom raised ranch offers country views, a nice pond and lots of additional storage space in the additional auxiliary buildings. The kitchen area is open and provides lots of workspace on the island as well as a pantry closet for all of your cooking essentials. Nice open views from the living area to the large back yard area with pond. The master suite offers a large walk-in closet, private bath complete with his and her sinks, jet tub and shower. All bedrooms have a private bath with an additional half bath found off the garage entry. The dining area is within the great room and has hardwood flooring where the dining table would be placed. There is also an unfinished basement with day windows. Egress windows are in place in the basement in the event you wanted to finish off additional sleeping space. If you are looking for a large home just outside of Tawas, this is a must see property. Call today for your private showing. Bedroom 1 Size: 21' x 15'6"
Br2 Size: 14'6" x 13'6"
Br3 Size: 14'6" x 13'6"
Br4 Size: 14'6" x 13'6"